The footpath begins by a little stone church. You hike around low, crumbling walls and an excavation site. You pause to take a few photos. Then you continue around towering trees and huge boulders. The moss-covered walls get higher and higher as you climb. The fortress is in front of you. You make your way inside the stone walls and follow the narrow ramparts. A strong gust of wind blows; you clutch the wall and turn away from the cliff. Eventually, you reach the tower. In the distance, you see a red-and-gold castle on one side, the white chimney peaks of another on the other side, and, farther away, the blue Atlantic Ocean. You feel like royalty. 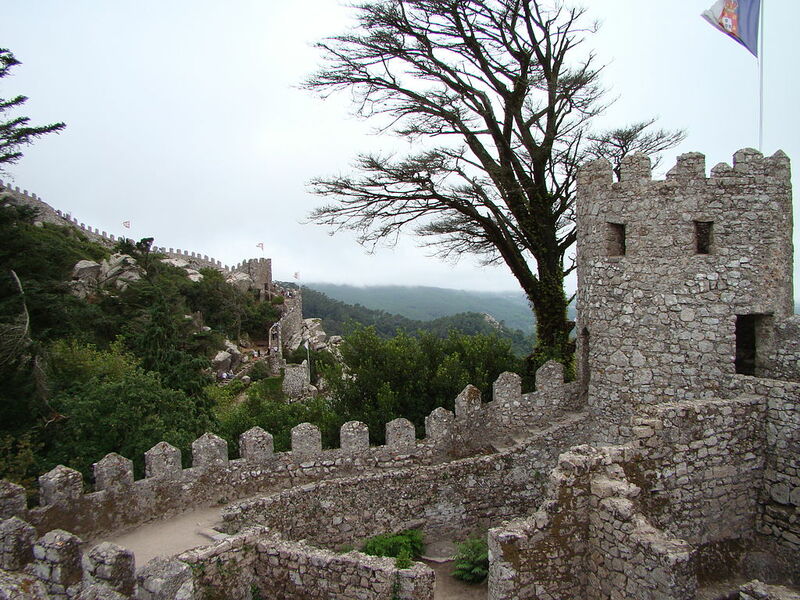 You’re in Sintra, Portugal at the ruins of Castelo dos Mouros. The Castle of the Moors was built in the 8th-9th centuries, overtaken by the Crusaders in the 12th century, and heavily damaged in a 1755 earthquake. 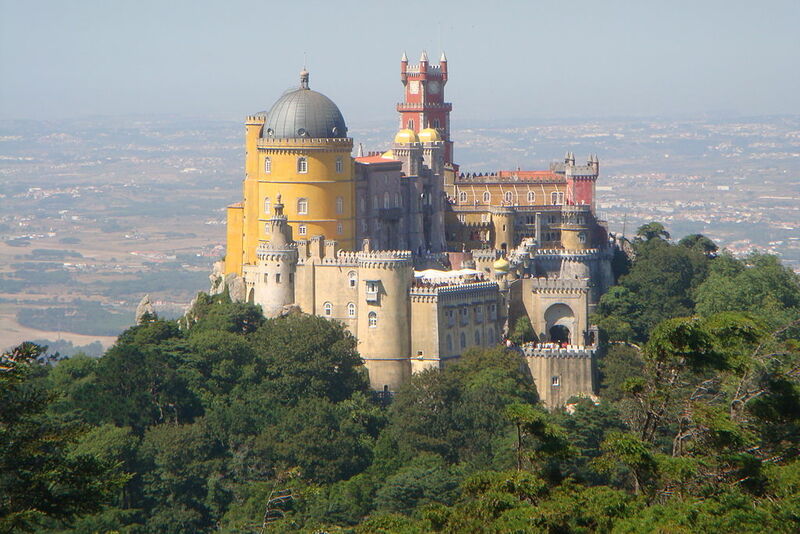 The Sintra Mountains are dotted with historic mansions, grand estates, and storybook-like castles. This is where the Portuguese royal family used to spend the summer. Now, it’s an easy—and popular—day trip from Lisbon. From Lisbon’s Rossio Station, it’s a quick, 40-minute train ride to Sintra. Walk through Parque da Liberdade. Freedom Park has plants and trees from around the world, short trails, and whimsical sculptures. Stop at the Moorish Fountain, which is decorated with mosaics. Visit the white, medieval Palácio Nacional de Sintra in the center of town. Sintra National Palace is known for its ornately decorated Swan and Mermaid Rooms, as well as its double chimneys. And then catch the 434 bus—no need to hike up the steep hill, you’ll get plenty of exercise later—to head into the lush hills. Castelo dos Mouros was your first stop. After exploring the ruins, walk back down the hill to catch the bus again. Next stop: Palácio Nacional da Pena. A chapel sat here in the Middle Ages. It was later turned into a monastery, and then the Bavarian-style castle was built as the royal summer residence by King Ferdinand II in the 19th century. Your tour begins in Pena Park, where you board a tram to wind your way up another hill. Keep an eye out for peacocks on your way up. From the oval chapel to the gargoyles to the Stag Room, the Romantic palace looks much like it did when Queen Amélie fled in exile in 1910. And on a clear day like today, you can see all the way to Lisbon from the terrace. You’d love to pick a bedroom and move in to the castle, but since you don’t own a crown, it’s time to head down the mountain and board a train back to the city to catch your dinner reservation in Bairro Alto. And by the time you order dessert, Sintra will feel like a fairy tale.